Categories Record categories / Sales catalogue Hard Rock/Metal/Punk Albums Progressive & Classic Rock Albums The Beach Boys - The Beach Boys Today! (1964) The Beach Boys Today! (1966) The Beach Boys Today! "The Beach Boys Today!" is the eighth studio album by the American rock band the Beach Boys, released on March 8, 1965. The album signaled a departure from their previous records with its orchestral approach, intimate subject matter, and abandonment of themes related to surfing, cars, or superficial love. It peaked at number four on US record charts during a 50-week chart stay and was preceded by the top 10 singles "When I Grow Up (To Be a Man)" and "Dance, Dance, Dance", along with "Do You Wanna Dance?" which reached number 12. When issued in the UK one year later, "Today!" peaked at number six. The album was produced, arranged, and largely written by Brian Wilson with additional lyrics by Mike Love. Shortly before recording began, the group completed their album "All Summer Long" (1964), intended to be their final statement on beach-themed music. In December 1964, Brian Wilson had a nervous breakdown while on a flight, and resigned from touring with the group to focus solely on writing and producing. "Today!" established the Beach Boys as album artists rather than just a singles band. Side one features an uptempo sound that contrasts side two, which consists mostly of ballads. Author Scott Schinder referred to its "suite-like-structure" as an early example of the rock album format being used to make a cohesive artistic statement. In 2012, the album was voted 271 on Rolling Stone magazine's list of the "500 Greatest Albums of All Time". In 2005, it was included in the musical reference book 1001 Albums You Must Hear Before You Die. By the end of a particularly stressful 1964, the Beach Boys had released four albums in 12 months, dismissed the Wilsons' father Murry from his managerial position and recorded the advance hit singles "When I Grow Up (To Be a Man)" and "Dance, Dance, Dance". Mid-1964 also saw the divorce of Mike Love from his first wife Frances St. Martin whom he had married in 1961. During the album's recording sessions, Love told Melody maker that he and the band wanted to look beyond surf rock, wanting to avoid living in the past or resting on the band's laurels. 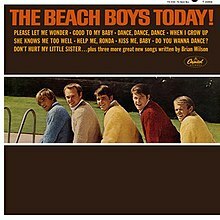 Brian Wilson had written his last surf song in April 1964, intending "All Summer Long" (released July 1964) to be the group's final statement on beach-themed music. Wilson became physically and emotionally exhausted to a point that he suffered an anxiety attack on December 23, 1964. During the recording sessions of "Today!" in January 1965, he informed the band that he intended to retire from touring and focus his attention solely on creating and producing music, to which the band reluctantly agreed. Wilson expressed regret over not having done this sooner so that he could do "justice" to the band's recordings, saying "I was run down mentally and emotionally because I was running around, jumping on jets from one city to another on one-night stands, also producing, writing, arranging, singing, planning, teaching – to the point where I had no peace of mind and no chance to actually sit down and think or even rest." According to Barry Mann and Cynthia Weil, in early 1965, Wilson phoned the couple to congratulate them on their new song "You've Lost That Lovin' Feeling", as Weil quotes Wilson: "Your song is the greatest record ever. I was ready to quit the music business, but this has inspired me to write again. I want to write with you guys." Despite being a departure from the Beach Boys sound that pervaded prior efforts, the album was a commercial success; "Today!" climbed to number four in the U.S. chart during a chart stay of 50 weeks and also reached number six in the British chart during the summer of 1966. Singles "Do You Wanna Dance? ", "When I Grow Up (To Be a Man)" and "Dance, Dance, Dance" had all charted. The album is described as a foreshadowing of the later Beach Boys' album "Pet Sounds". Alice Bolin of PopMatters writes: "Pet Sounds was released only a little over a year after Today!, and it can be hard to separate Today! from the masterpiece it led to—so much so that Today! can feel like a rehearsal for Pet Sounds, with its themes and ideas repeated and perfected in the later album." Scott Interrante adds "Pet Sounds is about growing up and moving on, and as such, it’s melancholic and reflective. But Today! is about the optimism, not the sadness, of leaving adolescence. Even on the more sentimental b-side songs, there’s a sense of excitement and longing for what the future has in store." In 2005, Today! was included in Robert Dimery's 1001 Albums You Must Hear Before You Die. In 2007, The Guardian named it one of "1000 Albums to Hear Before You Die". 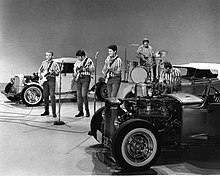 In 2012, a variety of musicians and writers voted the album at 271 for Rolling Stone's "500 Greatest Albums of All Time" list, with it stating: "The Beach Boys were still into cars, girls and surfboards, but Brian Wilson was already a genius. He writes sweet California tunes here, and the haunting 'She Knows Me Too Well' hits Pet Sounds-deep." Track list details per Craig Slowinski. Following a 1990s court case, Mike Love was awarded songwriting credits for "Good to My Baby", "Don't Hurt My Little Sister", "When I Grow Up (To Be a Man)", "Help Me, Rhonda", "Dance, Dance, Dance", "She Knows Me Too Well", and "In the Back of My Mind". All tracks written by Brian Wilson and Mike Love, except where noted. UK Capitol T 2269 mono (1965). Album produced by Brian Wilson. The album's laminated, flipback cover, is in excellent condition, displaying only minor signs of wear.